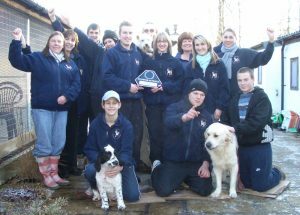 Newgate Kennels have been honoured over the years to win a number of awards. 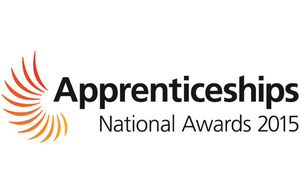 Not only were we awarded, “The North West’s National Apprentice Award for Small Business 2013” but we were also included in the list of 100 best apprenticeship employer’s in the country. The ceremony took place in Manchester and the award was presented by the record producing legend Pete Waterman. 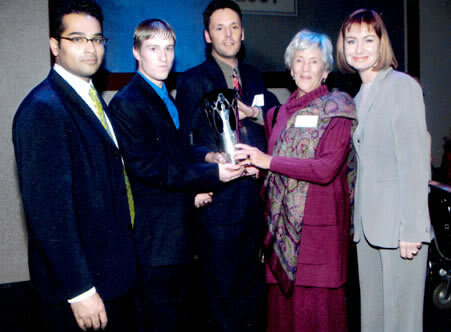 Pictured with Pete are Lucy and Joel and from Lite Ltd (our training provider) Jackie Shopland-Reed. 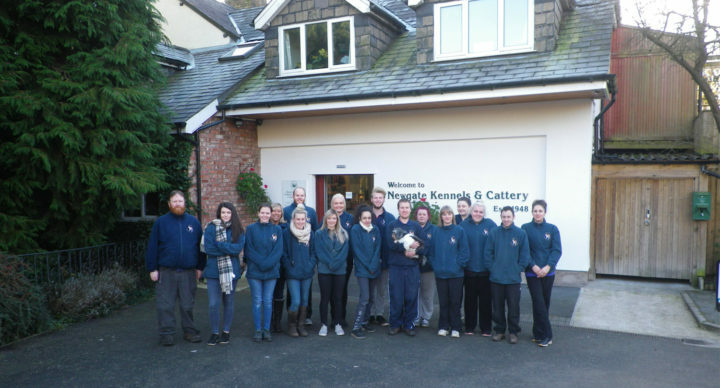 At the annual training award ceremony held at Crewe hall, Newgate Kennels was Highly Commended for its ongoing commitment to staff training and development. Phil B said it was a great evening and he enjoyed mixing with employees and management from other firms including Bentley Motors and BAE Systems. 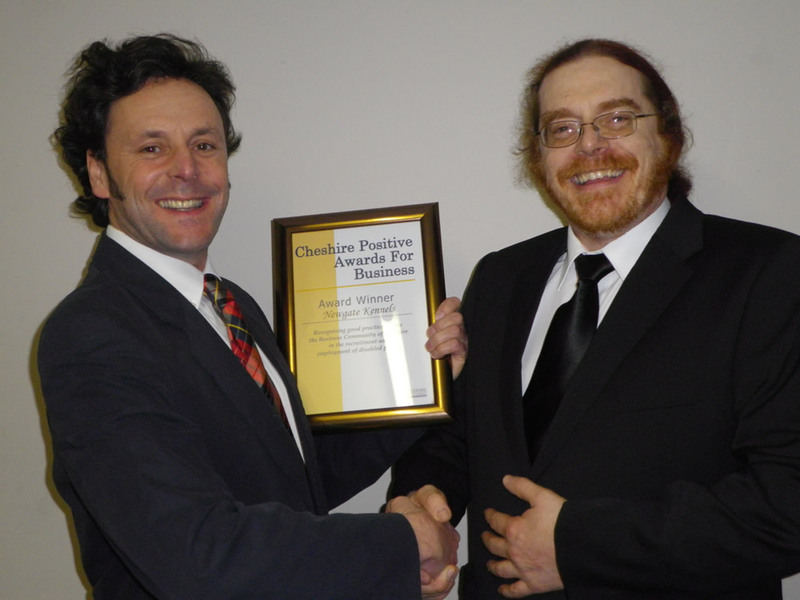 The Cheshire Positive Awards for business originated in 2003, the European Year of Disabled People. An annual occurrence recognising good practice throughout the Cheshire business community in recruitment, retention and employment of disabled people. Newgate kennels and Cattery were presented with the award for supported employment at a lavish ceremony at Hoole Hall in Chester. Pictured with the award are Joel and Michael. Michael came to work at Newgate in April 2008 sponsored by the government scheme to help people with disabilities return to full time employment. Michael had been suffering from severe sociaphobia, which prevented him leaving his own home for months on end. Michael started by working for a few hours a week which slowly increased to part time and then full time employment. Michael has progressed and is now a vital part of the workforce here at Newgate and in 2010 aims to complete his NVQ in Animal Care. The annual National Training Awards are the UK’s number one accolade for businesses, organisations and individuals who have achieved lasting excellence and success through workplace learning. 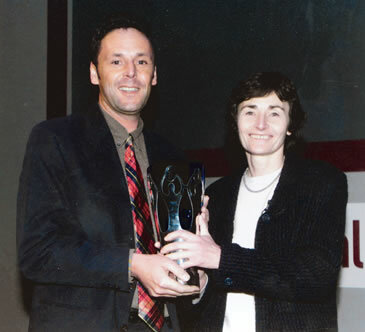 We were encouraged to enter the National Training Award 2001 after being awarded the Investor in People status in the previous year. Pictured left are Mike Harding (Business Link), Joe Millett (Newgate Kennels MD) and Diane Oxbrey. 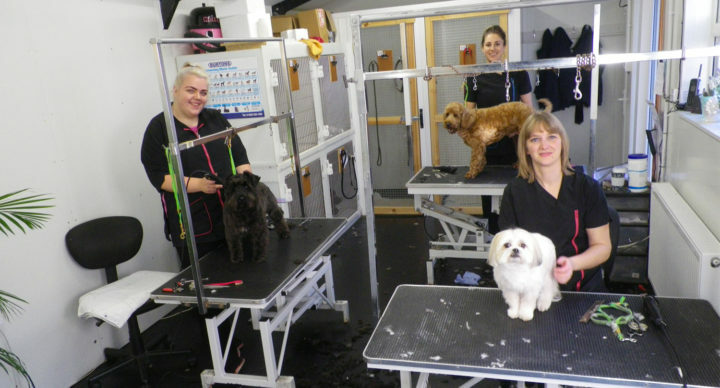 The photograph was taken at the regional National Training Award ceremony at the Lowry Centre when Newgate Kennels and Cattery won the small business section. Two months later at a glitzy presentation at the Theatre Royal London we went on to become the National Training Award winner in the category small business in the UK. Pictured left at the ceremony are the newscaster Krishnan Guru-Murphy and from Newgate Kennels Phil Broadhurst, Joel Millett, Erica Millett and the weather presenter Sian Lloyd. Investor In People is the national quality standard for effective investment in the training and development of all people to achieve business objectives. All companies have to be reviewed every three years to ensure they still meet the standards. We have so far been reviewed three times always passing with flying colours, the following is the last assessor’s outcome statement. 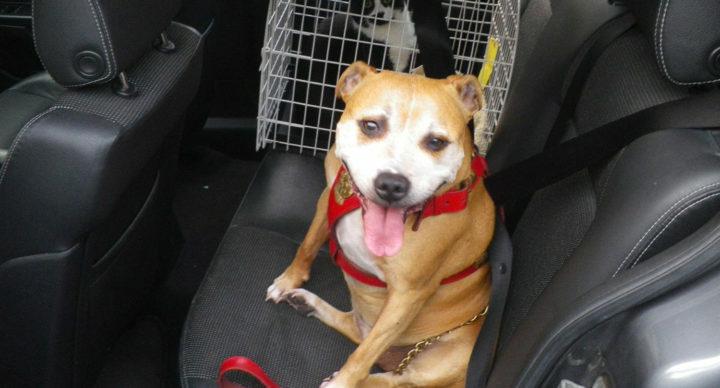 Having carried out the assessment process in accordance with the guidelines provided for assessors by Investors in People UK, the assessor was satisfied beyond any doubt that Newgate Kennels and Cattery Ltd continues to meet the requirements of the Investors in People Standard. On behalf of Centre for Assessment & Recognition (NW) Ltd the Assessor would like to congratulate Newgate Kennels and Cattery Ltd on this achievement.